Rediff.com » Business » These cars will steal your heart! These cars will steal your heart! Check out the stunning beauties at the North American International Auto show, in Detroit. The Ferrari 458 Italia is displayed at the auto show in Detroit. A model poses in front of an Audi A7 at the North American International Auto show in Detroit, Michigan. A model stands in front of the Chrysler 300c at the North American International Auto show in Detroit, Michigan. The Mercedes-Benz gull-winged SLS E-cell roadster is seen on display during the North American International Auto show in Detroit. 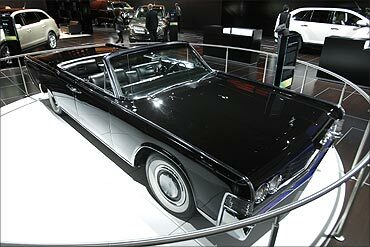 The 1965 Lincoln Continental used in the introduction to the television series "Entourage" is seen at the North American International Auto show in Detroit, Michigan. 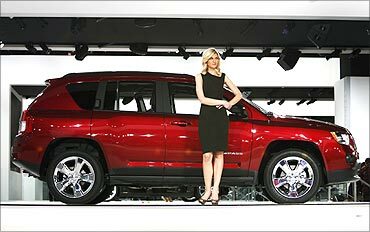 A model stands in front of the 2011 Jeep Compass at the North American International Auto show in Detroit, Michigan. 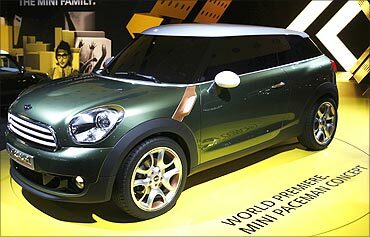 The Mini Paceman concept car is on display during the North American International Auto show in Detroit, Michigan. 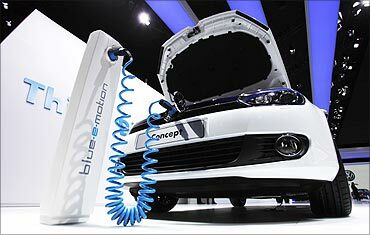 Volkswagen's Golf Blue-e-Motion concept car is plugged into an electrical outlet at the North American International Auto show in Detroit, Michigan. Display workers (from L) Courtney Schindler, Kalyn Krurska and Amy Gregory jump in front of a 2011 Camaro RS convertible on display as 27 still cameras are fired at the same time to make a 'Time Splice 3D' photo. The 2011 Dodge Challenger SRT8 392 at the North American International Auto show in Detroit, Michigan. 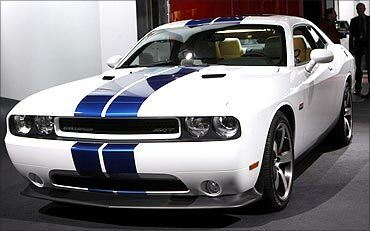 Image: Dodge Challenger SRT8 392. 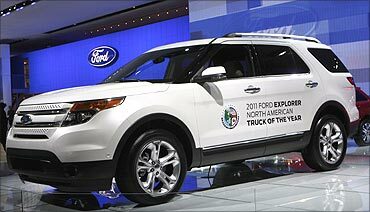 The 2011 Ford Explorer, winner of the North American Truck of the Year award at the North American International Auto show in Detroit, Michigan. Volvo reveals a crash tested C30 electric vehicle at the North American International Auto show in Detroit. Image: A crash tested C30. 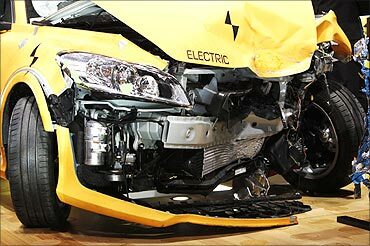 A crash test dummy is revealed in a crash tested Volvo C30 electric vehicle. 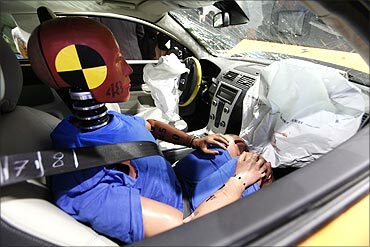 Image: A crash test dummy in Volvo C30. 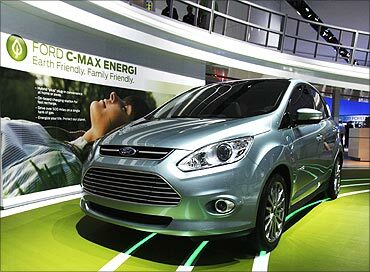 A Ford C-max Energi hybrid car is seen at the North American International Auto show in Detroit, Michigan. Image: Ford C-max Energi hybrid car.